1. Loch Oich at a mere four miles long and no more than a quarter of a mile across could fit into Loch Ness nearly 300 times over. In that light, it seems unlikely to be a sole habitat for its own monsters. 2. Loch Oich is connected to Loch Ness by the River Oich which flows about four miles as the crow flies between the two lochs. So it is possible for a Loch Ness Monster to navigate between the two lochs, though it would require some effort and motivation (e.g. chasing salmon runs). In fact, the difficulty of the trek makes it no surprise that sightings in Loch Oich are even rarer than in Loch Ness. 3. It is unlikely that two adjoining lochs have two separate and distinct species of unknown creature. 4. Sightings are so rare as to suggest a transient presence in the loch. Now looking at the history of the Loch Oich Monster, we first look back into the mists of time and the folklore tradition. When I was researching my book on Scottish Water Horses, I did not find any contemporary traditions of such a creature in Loch Oich (i.e. pre-Nessie era). However, author Alasdair Alpin MacGregor made reference to a water horse tradition in Loch Oich in his 1937 book "The peat-fire flame: folk-tales and traditions of the Highlands and Islands". Sadly, he supplies no further details or sources but given that he also mentions sightings of the creature in the previous year (see below), he was most likely inspired by these to verify older traditions. However, the first claimed mention of a creature in Loch Oich is by the famous Dutch cryptozoologist A. C. Oudemans in 1934 when he relates the tale of "The Children's Pool". This was a tale of children who saw a creature like a deformed pony appear beside a deep pool of the River Garry which feeds into Loch Oich. The children mounted the docile beast which then flew and plunged into the pool with the children to their doom. The story is believed to be from at least 1894 and though strictly this is perhaps more of a river Kelpie than a loch inhabiting Each Uisge, it is still worth a mention. Peter Costello, who related the Oudemans reference in his book "In Search of Lake Monsters" felt that Oudemans took the story a bit too seriously and I would agree with him as children riding to their doom was a common motif in the Water Horse genre across various lochs in the old Highlands (as related in the book "The Water Horses of Loch Ness"). Nevertheless, it does suggest an oral tradition of an Each Uisge in and around Loch Oich before modern times. So when is the first reported sighting of a strange creature in this loch? The answer as far as I can ascertain is 1936 when the Scotsman (and other papers) ran some articles on reports on a strange animal in Loch Oich. This would have been three years after Nessie hit the world headlines and by then things were relatively quiet at Loch Ness in terms of media coverage. The first report I have is from the 14th August 1936 (click on original report of the time below for more details). 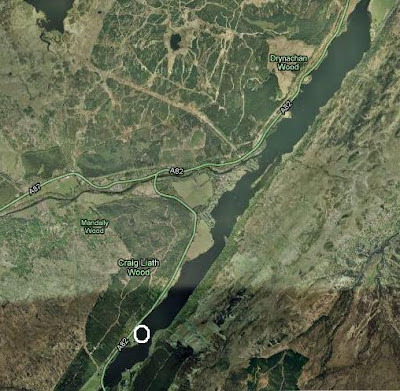 The date of the sighting would be Tuesday 11th August and involved a Mr. Alderman Richards, his son and a Mr. G M. Wilkinson who were boating at the southern end of the loch. A black two humped creature with a total visible length of 12 feet appeared a mere 36 feet from them and moved around at a decent speed. The head was described as dog-like and "shaggy" (though this description was applied to the head and not the humps). The head would be shaken vigorously as it resurfaced and the humps appear to have been uniformly semi-circular as they are described as three foot high by three foot across. Interestingly, the humps were described as "snake like coils" in appearance with three feet separating each visible part of the creature (i.e. a head and two humps). The creature continually submerged and reappeared in the sequence of rear hump first, other hump and then head. And so began a sequence of reports that received national coverage. Naturally, some will suggest the witnesses saw a line of otters playing together in the water and an appropriately configured line of otters can be produced to convince one and all (such as the image below). However, it is strange that none of the other otters decided to surface their heads at the same time plus three feet is far too high for an otter to be protruding out of the water. So we have a little mystery here. But things did not finish there and further reports appeared in the Scotsman twelve days later on the 26th August. This time, two sets of witnesses claimed to have seen the creature on the weekend of the 22nd August, namely a Mr. Alastair Grant and two other foresters and elsewhere some tourists including the former Canadian Minster of Agriculture, Duncan Marshall. No details of the sightings were given in that newspaper account, but in a subsequent Scotsman article from the 1st September, it was five foresters who saw the object which it turned out was a dark two part shape near the surface of the water about 8 to 12 feet in length and moving against the wind. The object submerged out of sight after about 100 yards. The two parts may have been humps but the high elevation of the sighting could not confirm the height of the object above water. Evidently, the Scotsman correspondent had done a bit more investigation as we are introduced to two further witnesses. The first was a 70 year old lady called Mary MacDonald who recounted the story of her father declaring the presence of a strange beast in Loch Oich in the 1870s. 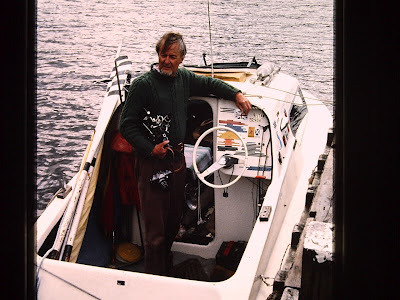 The second was a Simon Cameron who was the bridge keeper at the southern end of the loch. As it turns out, Mr. Cameron had lent his boat to the Aldermans when they had their sighting and had his own strange experience the very next morning (12th August) at about 7am from his house. The description sounds quite similar in that he describes seeing a shaggy dog-like head with a body at least six feet long with possibly more hidden beneath the surface. Curiously, the dog-like attributes are further enhanced when he describes the motion as "a dog-like action of its front feet or fins". Mr. Cameron was of the opinion that it was indeed an otter but "an enormous, great otter". In fact, an otter that does not even exist in Europe and which even the Giant Otter of the Amazon below would be challenged to match (picture source). Note it is uncertain from this picture how long the otter can sustain this "periscope" effect or whether it requires itself to be touching the bottom of the river in shallow water. Finally, it seems that Mr. Cameron had sight again of this creature for the Scotsman ran one final report on the 22nd September saying that he had seen the animal again on Saturday the 19th (clipping below). However, the report sounds so similar to the first that we wonder if the newspaper has not erroneously ran the same report again! This prompted one person to suggest this was a giant otter, perhaps even the extinct giant Megalenhydris Barbaricina which would certainly have exceeded six feet in length. However, the two humped aspect of these sightings would be a feat of contortionism beyond any otter. "Cameron was doubtless taunting the credulous reporter who failed to recognise the excellent visual description of a seal ..."
Doubtless he was .. if you require such anomalous reports to be seals. So Mr. Cameron is dismissed as a practical joker in the eyes of this sceptic without the slightest shred of evidence. This sadly is an accusation I have seen levelled at locals before - that they are a bunch of liars who cannot resist the temptation to deceive others. Evidently they lie to each other as well as the story of Mary MacDonald above suggests. Though it is crystal clear that some people have lied in the past, we should avoid needless extrapolation and dismiss such defamation at the more general level. "... dismissing the observations that do not suit your purpose ..."
As if sceptics never do such a thing (regular readers of this blog will get what I am saying)! But come rain or shine, this blog will continue to treat witnesses in a less dismissive manner. So 1936 came and went and, as far as I can tell, no more was heard of the monster of Loch Oich. Well, apart from a hoax by Jonathan Routh and some students in the summer of 1961 who set off a motorised "monster" down the loch. The thing was dutifully photographed and made its way into the Scottish Daily Express of the 8th July 1961. You can see a photo of their model in situ at this link. "A friend and I saw a large hump surface a few hundred metres east of the Well of The Heads and about 20 metres from the shore as we were driving along the road. It broke the surface and as it rose up we could see underneath it, so it obviously had some additional bulk on either side of the hump that was below the surface. It was dark coloured and rough and quite symmetrical. We ran down onto the shore with cameras but it had gone down again and the water was all disturbed. There was a small sailing boat from the Water Park nearby, tacking to and fro, and very close to the object but the sailor had their back to the object so did not see it. I'm very experienced in the outdoors, photograph and film nature professionally, and have decades of outdoors experience. My friend is a mountain guide and qualified naturalist with decades of field experience. Neither of us had seen anything like this. If I'd to hazard a guess as to what it was - it'd be a giant eel, But one that was 18 inches in diameter which is pretty extreme. Whatever it was it wasn't an emerging gassy tree trunk, nor a duck, nor a swimming deer, or a swimming sheep, nor anything else like that ALL of which I've seen. This was animate, and odd. And two of us saw the same thing. " 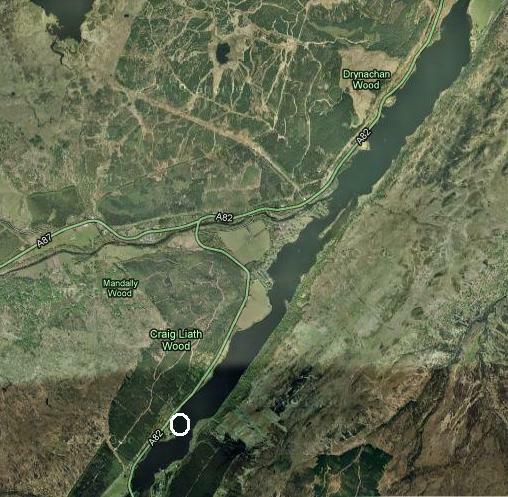 With the help of Google Earth we can show the rough location of the sighting from above (white circle) and on the road (where the Well of the Seven Heads monument is in the foreground). As the witness report suggests, there is good visibility of the loch and quick access to the shoreline. "And, fact is, if it was a seal I saw then that's even more remarkable because it would have to be huge. Two of us witnessed something really unusual - I've seen and filmed otters in a line doing a porpoise thing - mother and three cubs in/out/in/out of the water - THAT really looked like a monster. Swimming deer - seen those. Swimming sheep, seen them. Gassy logs - seen them too. Floating garden sheds - seen them. Divers working - seen them, done it too." "as it rose up we could see underneath it"
"Picture a large grey/green/brown inner tube 'stretched' so it wasn't entirely round and popped up out of the water. Initially it appeared to be a solid 'hump' but as it broke the surface you could see the underside of it as the water flowed off it, revealing the girth. Then it slid back under again vertically. It lasted only 20 seconds or so. We saw it as we drove, squealed with excitement, headed for the layby just before Well of the Heads and legged it onto the shore but it was gone leaving a frothy surface and the wind whipped it away." In other words, this was a coiled animal giving the appearance of a huge inner tube rising out of the water. The witness estimated its body to be one foot thick and it is no surprise he therefore speculated that it could have been a giant eel. Applying a normal length to diameter ratio for an eel to this creature would give a length of at least 13-20 feet. However, eels do not raise their body above the water in the manner of this creature (and neither do otters). This beast requires some other explanation. The other point to note is that the 1936 witness, Alderman Richards, described the humps in a similar manner as "snake like coils". In other words, it seems that he too described the creature as being "inner tube" in appearance 62 years before. Now I have to admit that the Loch Ness Monster is not generally described this way. If there is one argument for this beast being separate from Nessie then this is it. "but it was gone leaving a frothy surface and the wind whipped it away"
Now when animals submerge, they will disturb the water but they won't leave a frothy surface. This feature has been reported more than once when the Loch Ness Monster surfaces and submerges - a foaming kind of effect appears amongst the waves. That this appears to be more than just water is indicated by the witness' statement that the wind whipped it away. My conjecture is that this is something to do with gas/fluid ejecta which aids bouyancy but, of course, it is merely speculation. The fellow that comes to mind in this respect is the late Maurice Burton who favoured gas generated vegetable mats as an explanation for some monster sightings. This would indeed produce a frothing at the surface as the gas of decomposition raises the mass of vegetation to the surface and then dissipates leaving the clump to fall back down again. Whether Loch Oich at this apparently deep point could achieve this is another matter. However, what this experienced witness saw does not sound in any way like a frothing mass of vegetation. So the Loch Oich Monster reared itself up to human gaze in 1998, but will we have to wait another 62 years before anyone sees it again? Let's hope not. But then again, did not the previous story of old Mary MacDonald occur about 62 years before the accounts of 1936 ... ? Or perhaps more of a poll? I reproduce a version of the Hugh Gray picture at the top. The question is simple - which of the next four photographs after it (from seperate sources) does it most resemble? Ignore contrast and brightness and concentrate rather on features. The answer is picture three. Picture one is taken from Nicholas Witchell's book "The Loch Ness Story". Picture two is taken from Rupert Gould's book "The Loch Ness Monster and Others". Picture four is taken from Constance Whyte's book "More Than a Legend". Picture three is not a true Hugh Gray picture but this is admitted by the author Tony Harmsworth at his website (see link) as he merely doctored it to try and enhance the "labrador" he postulated was visible. The picture at the top with the bluish circle also discusses the Hugh Gray photo and expounds the labrador theory. However, in my opinion the author of that web page took Tony's picture but did not explain to readers of the web page that is was a doctored photo thus giving a false impression. I challenged the person on this point but they denied the picture was taken from Tony's website. Hence this little quiz. All comments which made a choice agreed with my assessment and I now move on. I recently received some photographs from Tony Healy who has given me permission to show them on this blog but remaining under his copyright. Tony is co-author with Paul Cropper of the book "The Yowie - In Search of Australia's Bigfoot" (see link). 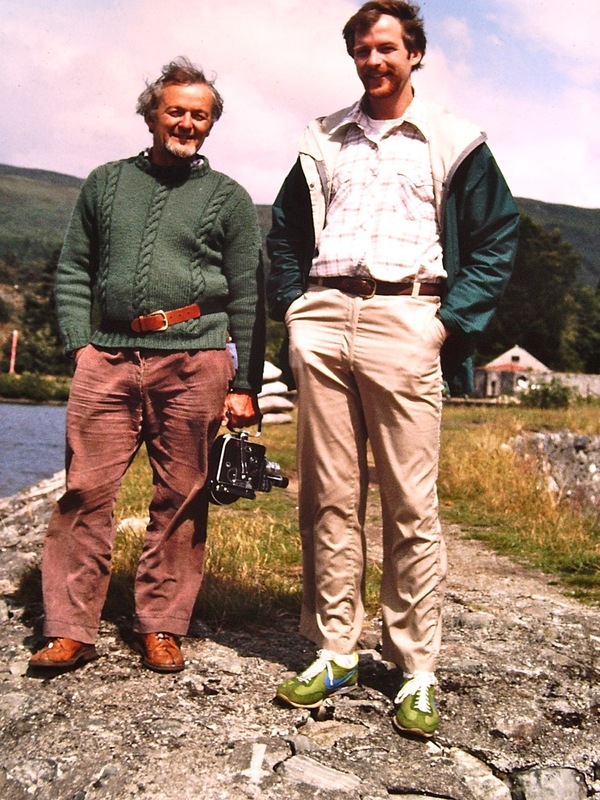 They were taken by him during his trips to Loch Ness and Loch Morar during the 1970s. There are three photographs which can be clicked to enlarge. 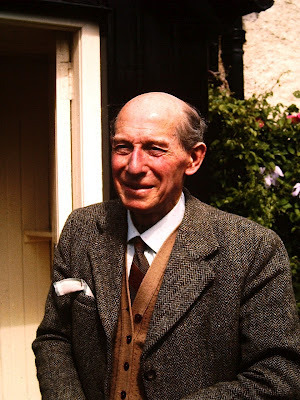 The first is of Alex Campbell, so long associated with the Loch Ness Mystery as correspondent to the Inverness Courier. The second is of famous Nessie Hunter, Tim Dinsdale and on his left is Joe Zarzynski, erstwhile hunter of the Lake Champlain Monster, "Champ". Finally, we have Tim in his "natural habitat" aboard his boat "Water Horse".